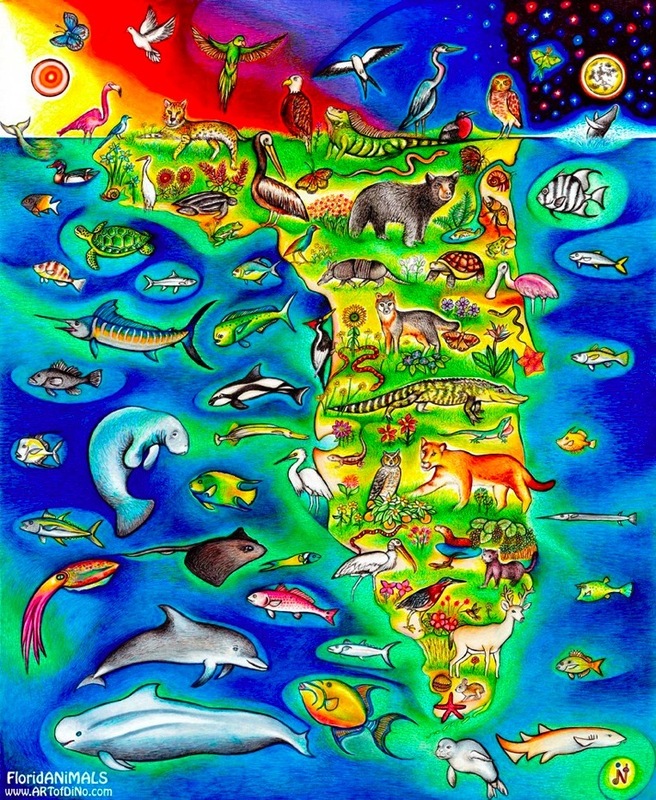 FloridANiMALS is a Map of Florida made of 115 Common Animals and Plants found in this tropical state. Many of the animals are endangered, some are native, while others somehow ended up there over time. This is an educational Artwork for All ages and is originally 15x17 inches of INK. The Artwork can be blown up to larger sizes, and shrunken down and represents a potential move for us as Artists from our home of 30+ years in Boston... to Florida. The goal is to use ALL of the proceeds from this Artwork in order to make the move possible. We are really craving a full year Art season, without cold and snowy winters. We love winter and New England, but are ready for a change. This is my way of honoring Florida while getting to know some of the local wildlife, further inspiring us to make the move. Wish us Luck. Contact dinodinap@aol.com with any questions or ideas regarding the use of this Artwork.